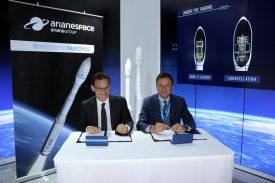 At the ILA Berlin air show, Arianespace signs a frame contract defining procedures for the procurement of launch services by the European Space Agency – marking a major step forward in ESA and European institutions’ full-fledged support for the next-generation Ariane 6 and Vega C vehicles. 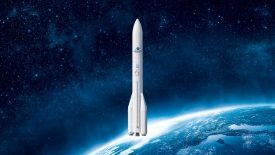 Arianespace receives the first launch contract for its next-generation Ariane 6, covering two future missions that will orbit satellites for Europe’s Galileo constellation using Ariane 62 versions The contract is to be conducted by the European Space Agency (ESA) on behalf of the European Commission and European Union. 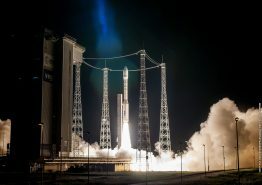 Vega’s perfect launch record continues with its dual-passenger flight that orbited observation satellites for the Italian Ministry of Defence and Israel Space Agency – marking 10 successes in as many tries since the light-lift vehicle started operation in 2012. Arianespace’s Flight VA238 marks the 80th successful launch in a row of the heavy-lift Ariane 5. The mission orbits the Hellas Sat 3-Inmarsat S EAN “condosat” – composed of two payloads for operators Hellas Sat and Inmarsat; as well as the GSAT-17 satellite for the Indian Space Research Organization. Arianespace announces the first launch contract signed for the upgraded Vega C, covering a mission to deploy Airbus’ new generation of very-high-resolution optical Earth observation satellites from mid-2020. The Ariane 5 heavy-lift launcher sets a new performance record on Flight VA237, carrying a total payload of 10,865 kg. to a geostationary transfer orbit (GTO) and besting its previous record by more than 100 kg. The net liftoff mass for the two satellites lofted was 9,969 kg. The successful launch, the 79th one in a row for the Ariane 5, successfully delivered the ViaSat-2 and EUTELSAT 172B telecommunications satellites to GTO; the EUTELSAT 172B is the first all-electric propulsion satellite to be delivered by an Ariane 5. 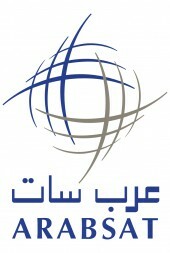 Arianespace converts to an SAS (simplified joint-stock company). The change, approved unanimously by company shareholders, streamlines and modernizes Arianespace’s governance to achieve greater responsiveness, facilitate relationships with industrial prime contractors, and be coherent with the new shareholder structure of Arianespace Participation. 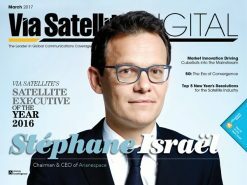 Arianespace Chairman & CEO Stéphane Israël accepts the Satellite Executive of the Year award for 2016 at the Satellite 2017 convention in Washington, D.C. 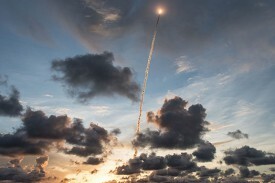 The award, bestowed by U.S. magazine Via Satellite, cites Israël’s role in overseeing an impressive streak of successful launches. Arianespace’s first launch of the year, Flight VS16, releases the Hispasat 36W-1 telecommunications satellite into a geostationary transfer orbit (GTO) – the first time the medium-lift Soyuz has performed a GTO delivery from the Spaceport in French Guiana. Flight VA233 marks Ariane 5’s 75th success in a row – surpassing the 74 consecutive launch successes of its Ariane 4 predecessor. The mission also is the heavy-lift vehicle’s first at the service of Europe’s Galileo program, orbiting four of the navigation satellites. 74 success in a row! Ariane 5 completes its 74th successful mission in a row, equaling a performance record set by the predecessor Ariane 4. This milestone Ariane 5 mission, designated Flight VA231, orbits the Sky Muster™ II satellite for Australian operator nbn (National Broadband Network) and the GSAT-18 satellite for the Indian space agency ISRO (Indian Space Research Organisation). Wiener Kernisan is named President of Arianespace’s U.S. subsidiary, Arianespace, Inc. He succeeds Clayton Mowry in this leadership position. The Ariane 5 ECA sets a payload lift record to geostationary transfer orbit, lofting a total mass of 10,730 kg. This mission carries two satellites for operators in the Americas and the Asia-Pacific region: EchoStar XVIII for the operator DISH Network L.L.C; and BRIsat for the Indonesian bank PT. Bank Rakyat Indonesia (Persero) Tbk. Arianespace celebrates 30 years of partnership with Japanese operators and manufacturers during its annual Japan Week event in Tokyo. Arianespace announces its 2015 financial results, which includes an all-time record order intake of 2.5 billion euros. Overall, the company posted a turnover of 1.433 billion euros - marking an increase of 2.4 percent over the previous record of 1.399 billion euros, set in 2014. Arianespace revamps its organization and executive committee to improve the company’s overall efficiency. This includes creation of a new Missions directorate in charge of overseeing the company’s quality, cost and deadline commitments. 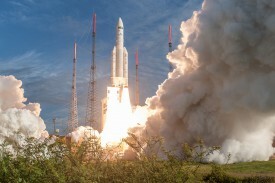 On Ariane 5’s 70th success in a row, the launcher orbits Intelsat 29e. It marks the 56th mission performed for Intelsat, continuing a partnership of more than 30 years. OneWeb announces its agreement for Arianespace’s role in deploying the OneWeb Constellation – involving 21 Soyuz launches, plus options for five additional Soyuz missions and three with the next-generation Ariane 6. The first Arianespace launch will take place in late 2017 and the full deployment will be completed by the end of 2019 – supporting the timely deployment for this global connectivity constellation. Planned changes in Arianespace’s shareholding structure signal a major step forward in the refoundation of European launcher industry governance: Airbus Safran Launchers (ASL) reaches an agreement with the French State and the French CNES space agency to transfer CNES's stake in Arianespace. After the completion of all regulatory consultation and approval procedures, Airbus Safran Launchers in consequence plans to hold 74 percent of Arianespace's share capital. Representing its best-ever turnover to date, Arianespace officially reports 1.399 billion euros in revenue for 2014 – a 41 percent increase from the previous year. The company also generated a net income of 3 million euros in 2014, with 11 total flights of its complete launcher family. Arianespace announces its 10th launch contract signing with Arabsat, with this latest agreement for the orbiting of HellaSat-4/Saudi Geo Satellite-1 in 2018 on Ariane 5. 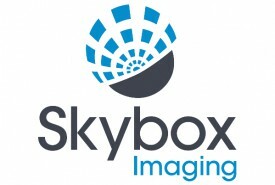 Skybox Imaging signs with Arianespace to launch a block of high-resolution imaging satellites from the Spaceport in 2016, becoming the first U.S. customer for Vega. Arianespace announces record revenues logged in 2014 – which are based on the company’s 11 total missions performed from French Guiana using Ariane 5, Soyuz and Vega launchers in the year. In doing so, Arianespace also set another all-time record, lofting 77.1 metric tons (23 satellites) into orbit during the 12-month period. With Soyuz’ on-target deployment of four connectivity satellites for operator O3b Networks on Flight VS10, Arianespace surpassed 500 satellites lofted since its creation in 1980. The mission also marked the company’s 11th total launch across its Ariane 5, Soyuz and Vega vehicles in 2014, which is a record for most in a year from the Spaceport since the complete launcher family’s introduction in French Guiana. Arianespace signs the order for its acquisition of 10 Vega launchers from Italy’s ELV, with these vehicles entering service at the end of 2015 and representing three years of operations. The production contract confirms the long-term viability of Vega, now established as the best launch vehicle in the light-lift class. On Ariane Flight VA219, Arianespace carries out its 60th consecutive successful mission with the heavy-lift Ariane 5 workhorse, lofting the fifth and final Automated Transfer Vehicle for the European Space Agency. This spacecraft – with a mass of more than 20 metric tons at liftoff – is also the heaviest payload ever launched by Europe. Arianespace’s fourth mission in 2014 – Vega Flight VV03, which delivered the Republic of Kazakhstan’s first Earth observation satellite to Sun-synchronous orbit – puts Arianespace on track for a record 12 launches to be performed during the year. Arianespace performs the 250th launch with its complete launcher family of Vega, Soyuz and Ariane-series vehicles. This milestone Ariane 5 liftoff (Flight VA217) successfully orbits ABS-2 for global satellite operator ABS and the French-Italian Athena-Fidus spacecraft. Arianespace announces its results for 2013, during which the company logged an unprecedented order intake of 18 launch contracts worth €1.4 billion, providing an overall record business backlog valued at €4.3 billion and equal to more than three years of launches. Arianespace wraps up a banner year in terms of commercial orders – with 15 satellites won for Ariane 5 launches to geostationary transfer orbit, and four satellites booked for Vega. Soyuz Flight VS06 orbits the European Space Agency’s Gaia billion-star mapping spacecraft, marking the 25th spacecraft dedicated to science launched by Arianespace. Arianespace signs the contract for 18 additional Ariane 5 ECA launchers with Astrium, following an agreement concluded earlier in the year for long-lead items on these vehicles. This latest batch will be available for missions starting in 2017. The construction go-ahead is given for a new facility to fuel the Soyuz vehicle’s Fregat upper stage, to be located in French Guiana at the Spaceport’s Soyuz launch complex. Arianespace signs an initial agreement with Astrium to begin production of 18 additional Ariane 5 ECA launchers, covering long-lead items and early production activities for these heavy-lift vehicles valued at more than 400 million euros. Arianespace reaches a record backlog of orders from 26 customers worth more than 4 billion euros, following the announcement of five new launch contracts at Euroconsult's World Satellite Business Week in Paris. Vega’s second flight from French Guiana marks the start-up of mission operations under Arianespace responsibility for this light-lift launcher. A trio of satellites, including Vega’s first commercial payload, are orbited during the successful mission. Stéphane Israël is appointed Chairman & CEO of Arianespace, succeeding Jean-Yves Le Gall – who led the company since 2001 and earlier in April 2013 was named President of French space agency CNES (Centre National d’Etudes Spatiales). Arianespace announces a three-satellite launch services contract for Intelsat, with the spacecraft to be orbited through 2017 by Ariane 5 vehicles from the Spaceport. The deal covers the 52nd, 53rd and 54th payloads that Arianespace will orbit for this leading provider of satellite services, continuing a nearly 33-year partnership. Arianespace is selected to orbit the first two satellites for Australian operator National Broadband Network (NBN). These spacecraft are scheduled to be lofted by separate Ariane 5s in 2015 from the Spaceport. NBN’s satellites mark the eighth and ninth Australian satellites entrusted to Arianespace. Arianespace announces the signature of a long-term multiple launch services agreement with Eutelsat Communications. This accord covers up to four launches in the 2016-2017 timeframe and extends an agreement between the two companies signed in July 2012. Arianespace’s Starsem affiliate completes the fourth and final Soyuz mission contracted by Globalstar to deploy its second-generation satellite constellation on flights performed from the Baikonur Cosmodrome. This is Starsem’s 26th consecutive successful Soyuz launch since the company conducted its maiden commercial Soyuz mission from the Kazakhstan launch site in 1999. Arianespace announces an exceptional business performance for 2012, with its 10 commercial launch contracts signed for GTO (geostationary transfer orbit) payloads representing a 60 percent share of the worldwide market for the year. A Vega launch contract is signed by Arianespace with Astrium for the VNREDSat-1A Earth observation satellite on behalf of the Vietnamese Academy of Science and Technology. This Astrium-built payload is scheduled to be orbited during the second quarter of 2013 on Vega’s no. 2 mission from French Guiana. Ariane 5 lofts the Skynet 5D and Mexsat Bicentenario satellites, wrapping up a year in which 10 Arianespace launcher family missions are performed from the Spaceport. This activity involved seven heavy-lift Ariane 5 flights, two with the medium-lift Soyuz, and the lightweight Vega’s inaugural launch. EchoStar selects Arianespace to launch multiple new satellites over a multi-year period from the Spaceport in French Guiana. This new contract provides EchoStar with launch capacity and flexibility for its satellite program. EchoStar’s relationship with Arianespace dates back to 1996 with the launch of EchoStar II. Arianespace confirms the reliability and performance of Ariane 5 with the heavy-lift launcher’s 50th consecutive mission success. This milestone mission orbits the Intelsat 20 and HYLAS 2 satellites, delivering a world-record performance of nearly 10.2 metric tons total mass launched to geostationary transfer orbit. Arianespace signs a Vega launch contract with Astrium for the DZZ-HR high-resolution observation satellite, which will be operated by Kazakhstan. Scheduled for orbiting in the second quarter of 2014, the DZZ-HR agreement marks Arianespace’s third contract for Vega, and the first to serve an end-customer outside of Europe. Arianespace’s total number of primary satellite passengers launched in its operations from French Guiana surpasses the 300 milestone with an Ariane 5 mission that orbits the JCSAT-13 and VINASAT-2 communications satellites. This overall total does not include some 50 additional auxiliary or secondary payloads lofted on Arianespace flights. 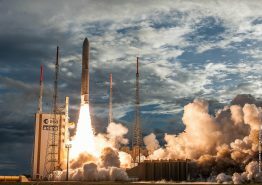 The qualification flight of Vega – performed under European Space Agency responsibility – is a success, clearing the way for Arianespace to take charge of the lightweight launcher’s commercialization and operation. An Arianespace/Starsem Soyuz mission from Baikonur Cosmodrome with Globalstar second-generation satellites closes out a very busy year of launch activity. The total of nine flights performed during 2011 were composed of two Soyuz launches at Baikonur Cosmodrome conducted by Starsem on behalf of its Arianespace parent, along with Arianespace’s first two Soyuz liftoffs from the Spaceport in French Guiana, and five Ariane 5 missions from the Spaceport – lofting a total of 29 payloads with a combined mass of more than 63,000 kg. Arianespace announces the first commercial contract signing for its Vega lightweight launcher, booking two satellites in the Sentinel-2 and Sentinel-3 families dedicated to Europe's GMES (Global Monitoring for Environment and Security) program. The launches are scheduled for 2014-2016 from the Spaceport in French Guiana. For the first time, flight preparations are underway with each member of Arianespace’s full launcher family operating from French Guiana: the heavy-lift Ariane 5, the medium Soyuz and lightweight Vega. This activity further underscores Arianespace’s ability to offer mission performance truly tailored to customer requirements in missions from the Spaceport. The Arianespace launcher family becomes a reality as operational versions of the Vega, Soyuz and Ariane 5 are present in French Guiana, positioned for upcoming missions. The no. 1 Vega for this lightweight launcher’s VV01 qualification flight in January 2012 arrives from Europe aboard the MN Colibri sea-going ship, along with a heavy-lift Ariane 5 for the VA205 mission in early 2012 with Europe’s third Automated Transfer Vehicle. They join a Soyuz that is being prepared for Arianespace’s second launch of the medium-lift vehicle from the Spaceport, which is scheduled for December 16, 2011. The medium-lift Soyuz enters Arianespace’s launcher family at the Spaceport with a successful inaugural flight that orbits Europe’s first two Galileo navigation satellites. The second launch campaign for a Soyuz mission from French Guiana begins, putting in motion the preparations for a mid-December 2011 liftoff with the French CNES space agency’s Pleiades optical Earth observation satellite, accompanied by five supplemental payloads. This activity is performed in parallel with preparations for Soyuz’ maiden flight from the Spaceport. The first Vega to be launched from the Spaceport departs Europe aboard the MN Colibri roll-on/roll-off ship for its sea-going voyage to French Guiana. After arriving at the Spaceport, this Vega will be prepared for a liftoff scheduled in January 2012 with a multi-spacecraft payload composed of the LARES satellite and nine small cubesats from European universities. This will serve as the vehicle’s qualification flight, opening a series of missions to demonstrate the launch system’s flexibility. Arianespace marks a major milestone in the expansion of its launcher family as launch campaign activity begins for the first Soyuz mission from French Guiana. The historic flight is scheduled for liftoff on October 20 with a payload of two In-Orbit Validation (IOV) spacecraft for Europe’s Galileo satellite navigation system. The medium-lift Soyuz - which is Arianespace's newest launcher family member - takes a major step closer to its service introduction with a highly realistic simulated launch from the Spaceport. Soyuz marks a major step closer to its service introduction at the Spaceport with the Russian-built vehicle’s first rollout to the launch pad during a full-scale “dry run” exercise. The maiden flight of Soyuz from French Guiana later is targeted by Arianespace for later in 2011 with two European Galileo navigation satellites. During a successful mission at the service of two new customers – the Al Yah Satellite Communications Company, and a joint venture of Intelsat and Convergence Partners – Arianespace sets a new heavyweight record with its workhorse Ariane 5 launcher: a combined payload mass of 8,956 kg. for the Yahsat Y1A and Intelsat New Dawn satellites, delivering a total lift performance of 10,050 kg. to geostationary transfer orbit. The historic 200th flight of an Ariane family vehicle successfully orbits Europe’s second Automated Transfer Vehicle, which is the heaviest payload ever lofted by Ariane 5. Another highly successful year is completed, with Ariane 5 orbiting 12 telecommunications satellites in six dual-payload missions from the Spaceport, along with a Soyuz flight from Baikonur Cosmodrome that lofted six Globalstar second-generation satellites. In new business, 12 contracts were signed by Arianespace for GTO payloads in 2010, which were complemented by 12 spacecraft to be placed in low- and medium-Earth orbit on Soyuz missions. Arianespace is granted its license as a launch service operator, in application of French law on space operations. Arianespace successfully lofts the ASTRA 3B commercial telecommunications satellite and Germany's COMSATBw-2 military relay platform from Europe’s Spaceport, marking the 50th flight of its heavy-lift Ariane 5. The no. 1 Soyuz assembled at the Spaceport completes its initial phase of integration with the mating of the four first-stage strap-on boosters to the Block A core second stage. This will be the first Soyuz 2-1a vehicle to be operated from French Guiana by Arianespace. Arianespace marks the 30th anniversary of its creation as the world's first commercial space transportation company. Now the world’s leading launch Service & Solutions provider, Arianespace has lofted more than half of all the commercial satellites currently in service worldwide. The support contract for Vega’s first launch campaign is signed by Arianespace and the European Space Agency. Testing of the lightweight launcher will be conducted at Europe's Spaceport starting in April 2010, paving the way for the first flight later in the year. Arianespace signs a launch contract for the first 10 spacecraft in Europe's planned Galileo satellite positioning system in the Netherlands. These spacecraft will be orbited in pairs starting in December 2012, using five Soyuz launchers operated from the Spaceport in French Guiana.